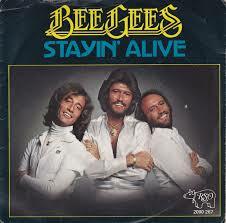 The Bee Gees’ ‘Stayin’ Alive’ enjoyed a 6th week at 1 and they were now the outright leaders for total weeks at 1 as they had amassed 20, moving them 1 ahead of The Sweet who had 19. There would be only 1 other act that would manage 20 or more weeks at 1. With ‘Night Fever’ unmoved at 3, The Bee Gees still had 2 in the top 5, but ‘How Deep Is Your Love’ dropped from 5 to 6 to end their 2 week run with 3 of the top 5. Suzi Quatro’s ‘If You Can’t Give Me Love’ moved up 4 from 15 to 11 to take the climber of the week award and was the only star rater this week. Wings’ ‘Mull Of Kintyre’ was the one heading in the opposite direction at pace as it dropped 4 from 8 to 12 to take the faller of the week award. It was however, still the oldest on the chart, being on 22 weeks and enjoying its 10th week as the oldest. Only 9 songs so far had managed this many weeks as the oldest. There was just 1 song going from the chart this week and that was Debby Boone’s ‘You Light Up My Life’ which managed 18 weeks and peaked at 3. This would be her only SA chart hit and it brought the curtain down on the Boone Family’s involvement in our charts. We had seen 1 Pat Boone hit (Debby’s Father), one hit credited to The Boones (Pat’s daughters including Debby) and one hit credited to The Pat Boone Family. In total the Boones had managed 40 weeks in the charts with ‘You Light Up My Life’ clocking up the most of the 4 hits while it shared the best peak of 3 with Pat Boone’s ‘Pearly Shells’. In case you are wondering, Daniel Boone who had 4 hits from 1972 to 1973 was no relation. The only new entry this week came from Emmylou Harris. It was a cover of a Dolly Parton song called ‘To Daddy’ which Parton recorded in 1976 but did not officially release until 1995 when it appeared on a compilation called ‘The Essential Dolly Parton One’. Harris’ version would go to number 3 on the US Country Singles charts and top the Country Singles charts in Canada. The song was produced by Brian Ahern who produced a load of albums for Anne Murray as well as working with country stars such as Johnny Cash, George Jones and Glen Campbell. Harris was exactly 31 years and 2 months old when she charted in our charts. ‘How Deep Is You Love’ by The Bee Gees became the 45th song to reach 20 weeks in the charts. So far only Four Jacks & A Jill and Vicky Leandros had seen 2 songs reach 20 week. ‘How Deep Is Your Love’ also celebrated passing the 300 point mark and was the 32nd song to get to 300 or more. Smokie celebrated getting to 800 points in total, moving on to 806. They sat 30th overall.